You can't watch TV, YouTube or even listen to the radio without hearing about Question 3. There are literally 100 million reasons why that's the case. The issue is referred to as either "energy choice" or "deregulation" depending on which side you are on. The $100 million in campaign donations, to date, make the battle over the future of Nevada's electricity market the most expensive in silver state history. The Coalition to Defeat Question 3 bringing the bigger bank account into the fight, with reports showing just over $63 million dollars in campaign contributions, more than 99 percent of that put up by NV Energy whose monopoly is being challenged. Opponents are questioning the spending. "That is $63 million in ratepayer money, the money that we paid in electric bills," Dave Chase with Nevadans for Affordable, Clean Energy Choices said. 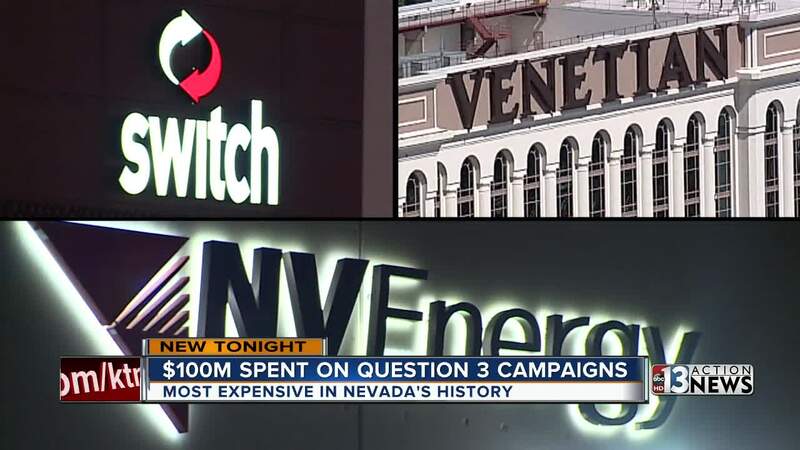 Nv Energy says customers have not and will not fund the company's campaign contributions. "NV Energy made the decision to join the Coalition to Defeat Question 3 after it became clear that our customers, as well as those Nevadans we do not serve with electricity or gas, were hearing misleading and inaccurate information about Nevada's electric rates and record on renewables. NV Energy is supporting NO on 3 in order to protect all Nevadans, including our 2450 employees, from the risks and costs that other states have faced as a result of electricity deregulation." The Coalition to Defeat Question 3 includes thousands of diverse individual members, community leaders, elected officials, small businesses, community and environmental organizations, and business groups from across the state who have come together to oppose this misleading ballot measure. On behalf of our members, the Coalition remains deeply committed to making sure Nevada voters get all the facts about the risks, costs, and uncertainties surrounding Question 3. We intend to continue operating a robust, fact-based campaign to defeat this deeply flawed Constitutional Amendment that would cost Nevadans more than $4 billion if passed. All campaign finance information has been and will continue to be reported in full compliance with state laws. When it comes to campaign funding, supporters of energy choice aren't getting their money from many more sources themselves. Nevadans for Affordable, Clean Energy Choices showing nearly $33 million in contributions, 99 percent of those contributions coming from just two companies Las Vegas Sands Corp and Switch. Critics saying the large companies are pushing for a constitutional change that would benefit them while leaving a questionable future for homeowners. A claim supporters of Question 3 dispute. "85 percent of the folks who are large energy users, who have the right under Nevada law to leave NV Energy, have already left or have filed to leave. The idea that energy choice is simply for big users in just not accurate," Chase said. While the results will not be known until November, one thing is clear both sides are putting millions on the line to get their way. A September poll by the Reno Gazette-Journal and Suffolk University showed opponents of Question 3 with a 19 point lead in the race. That same poll showed 16 percent of voters were still undecided.